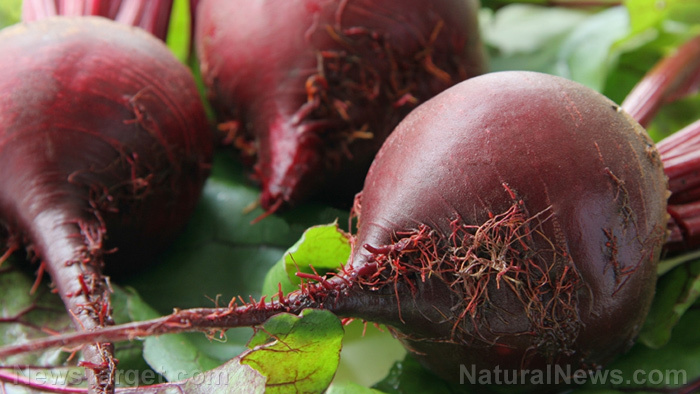 (Natural News) Several studies have determined the “mechanisms of action” of beets, and findings show that the plant can boost body systems and impact blood pressure, heart health, and cognitive function. Beets (Beta vulgaris, Chenopodiaceae) are currently being used as a sports performance supplement ingredient. Study findings have also determined that beetroot, or the taproot of the beet plant, can enhance athletic performance and endurance. Beetroot has various health-promoting compounds such as betaines, quercetin, and resveratrol. But research concerning the potential sports performance benefits of beets has often focused on nitrates. Nitrates in beets are turned into nitrite, while some are turned into nitric oxide, which is crucial to blood pressure regulation, cardiovascular function, and mitochondrial energy production. Studies have determined that dietary nitrate supplementation has certain exercise performance benefits. Other research has also shown that supplementation can minimize the oxygen cost of submaximal exercise, or exercise done at a lower intensity compared to the maximum that a person is capable of, and maximized high-intensity exercise tolerance among recreational athletes. A separate study from 2011 also illustrated that beetroot juice full of nitrates may help boost oxygen efficiency in submaximal cycling exercise. A different 2017 study looked into how beetroot affects individuals performing high-intensity/intermittent-type exercise. The double-blind, placebo-controlled crossover study, which was spearheaded by Jean Nyakayiru of the Department of Human Movement Sciences at NUTRIM School of Nutrition and Translational Research in Metabolism at Maastricht University Medical Centre (Maastricht UMC+) in the Netherlands, analyzed if six days of nitrate-rich beetroot juice supplementation can boost the exercise performance of trained soccer players. The 32 participants consumed two 70-milliliter (mL) doses of beetroot juice (140 mL per day) with 800 milligrams (mg) of nitrate or two 70-mL doses of similar tasting beetroot juice placebo (without any nitrate) for six days. The subjects ingested the final dose three hours before the exercise test. The distance covered during the test was used to measure performance and heart rate was measured continuously. Blood and saliva samples were also taken before the test. The researchers determined that nitrate-rich beetroot juice ingestion helped boost subject performance by 1.3 to 3.4 percent compared to the placebo group. The researchers concluded that participants who ingested beetroot juice and exercised had brain networks that were more similar to those of younger adults. This highlights the possible enhanced neuroplasticity that can be gained by exercising regularly and drinking beetroot juice. Further study involving more diverse populations can help determine the other exercise advantages and potential health benefits of dietary nitrates. Additional safety data can also help explain the outcome of continued intake and the advantages or disadvantages of ingesting dietary nitrates from beets alone, compared to getting nitrates from other vegetable sources. They can help you lose weight — Beets have a high water and low calorie content, both of which can be good for those trying to lose weight. They can improve digestive health — Beets contain fiber, which is good for digestive health. It can also lower the risk of various chronic health conditions. They may have anti-cancer properties — Studies in isolated human cells and rats have proven that the pigments in beets can help hinder the growth of cancer cells. They are rich in nutrients yet beets only contain a few calories — Beets are full of vitamins and mineral but low in calories and fat. You can read more articles about the health benefits of eating beets and other fresh food at Fresh.news.